I'm considering a Nelson 22 conversion for my SARO 45 A1. I'm presently shooting a customized Ruger MK3. It shoots good and better than I can hold. However my interest is to ease the transition between 22 and 45 stages by using same frame and trigger feel as well as improve my 45 results. I've done some research but still unclear on a couple of points. If some can share their perspectives it would be helpful and appreciated. 1. Do I need to worry about slide to frame fit to achieve needed BE accuracy as for 45 or is it sort of a non-issue? For example can I reasonably expect 3" at long line with good ammo without custom fitting or is it like buying a stock 45 and hoping for the best? If custom fitting is needed what is involved? The present 45 frame it would go on is a stock SARO fit - which is actually pretty good considering its stock. 2. Would I have cycling issues with a 1" UD tube optic? Would I need to have recoil spring lighter than the 8# and 9# that come with the kit shooting CCI SV? 3. I plan to use existing 45 receiver and swap out between 45 and 22. It seems quick to do but is there reasonably enough time to do the conversion between 22 and CF stage when shooting a match? I suppose it would depend on the match. For example I would just ask for more time at my league provided it wasn't more than a minute or so but not sure about more formal matches which I haven't shot yet. I realize it is ideal to have a dedicated frame and would probably get there eventually but wondering how much of a hassle the change out is in the meantime to spread costs. 1) slide to frame fit not important with fixed barrel. Don’t sweat it! 2) optic is mounted on rail that is mounted to fixed barrel so slide cycles independently. 3) only takes 2-3 minutes to change from 22 to CF. So go for it! Many shooters use this setup successfully. Obviously what mine did isn't a guarantee but I've heard plenty of folks brag on Nelson's accuracy and never heard anyone complain about it. One tip if you plan to do the switch from 22 to 45. use a full length guide rod on the .45 (I use a 2 piece). With the full length rod when you take the slide off, the recoil spring, rod and slide all stay together so it all you have to worry about is not losing the slide lock. That was what I was hoping to hear as this seems a relatively cost effective way to go - all other options considered. I understand it better now. I feel more confident now that I should expect good results from it. That accuracy testing testimonial is quite impressive. Understood mileage may vary but that case at least is encouraging. Leaning towards pulling the trigger so to speak. Here is a go figure. I have bench tested my Nelson, High Standard Victor, 7" model 41 and a Buckmark that all had better groups at 50yds then the Nelson. Not much better, but better. I posted pictures of the groups 5/6 months ago. None of the groups would have been outside the 10 ring at 50. All of that testing was a waste of time because I average about 15 points higher with the Nelson when shooting a 900 then I have been able to shoot with any of my other pistols. It is kind of fun shooting Master scores again at matches. If you can afford it get a dedicated lower so you don't have to swap back and forth. Then you can set your trigger down to 2.5 lbs. Two lbs is legal but it is hard to set up a 1911 much below 2.5 and 2.5 feels light enough. Just my .02 worth. I shoot a Nelson. It's my "go-to" or "primary" 22 pistol. 1) Like Jon said, don't worry about slide to frame fit. The conversions are designed to slide on to and function with "most" 1911 pistols chambered for 45ACP. The barrel is fixed. Only the slide moves. Theres plenty of clearance for it to work. In fact, my Nelson's frame is a Range Officer. No fitting. Put it on a shoot. Sort of... you'll see about the springs below as you read. 2) Scope base or iron sights, both are mounted directly to the barrel and the barrel is fixed. The sights will not be moving with the slide so no worry about weight of a dot sight impeding function. You may find some ammo works better with 8# and some works better with 9#. Depends on ammo velocity. Use the spring needed for the ammo that shoots the most accurate. 3) At one time I was using one type of ammunition at 50 yards with a 9# recoil spring, and another kind of ammunition for 25 yards with an 8# recoil spring. The way I shoot my slow fire targets, I have plenty of time to change recoil springs after my last slow fire target and be ready for 25 yards before the 10 minutes is over. It's quick if you're familiar with the unit. So relating that to your question about changing out to 45, it's quick. Loosen guide rod, pop pin, off comes Mr. 22 and on goes the 45, insert pin, and you've now gone big bore. The only thing I'll say about the 22 to 45 trick is that the Range Officer comes with a heavy mainspring that won't work well with a 22 unit. You'll probably see better reliability if you use a reduced power mainspring. Most use a 19#. On occasion, the mag catch that works for a particular .45 lower may not work properly with the Nelson mag. As part of my change over from .22 to .45, I had to change out the mag catch, i.e. I had two mag catches. One to be used with the Nelson. One to be used for the .45. Another poster suggested a full length guide rod. I concur and I also use a two piece full length guide rod. Do you know the brand of mag catch you are using on the .22 Nelson? Do I assume correctly that that catch is positioning the .22 Nelson mag higher towards the chamber? Are you in fact using Nelson plastic mag's or something else. If it is something else what brand and material? Second question : two piece guild rod is for ease of quick change over ( same lower ) or an additional something else ? You cannot use higher mag catch with plastic magazines or gag. Steel mags can be modified/tuned for the higher catch. Thanks for the quick reply. I was curious what others have done and with what mags brands have had the highest reliability , I would assume if the mag is setting on the catch a little low slight mod to the follower stop slot or mag lips is the preferred method depending on the mag brand and material. Is safe to say most are have the most reliability with either the Nelson mag or the steel GSG mag at least in the 1911/Nelson conversion? and possibly old ACE mags? FYI the GSG mags aren't steel, try to stick them to your magazine magnet in your box, some type of die casting I believe, maybe zinc. The steel mags Jon is referring to are the Triple K magazines, they are copies of the Colt Ace magazine, they sell for $52 new. Jon is fitting a couple of these to my Marvel that I was having issues with. I prefer steel magazines because they are tunable to control the nose of the cartridge during feeding. 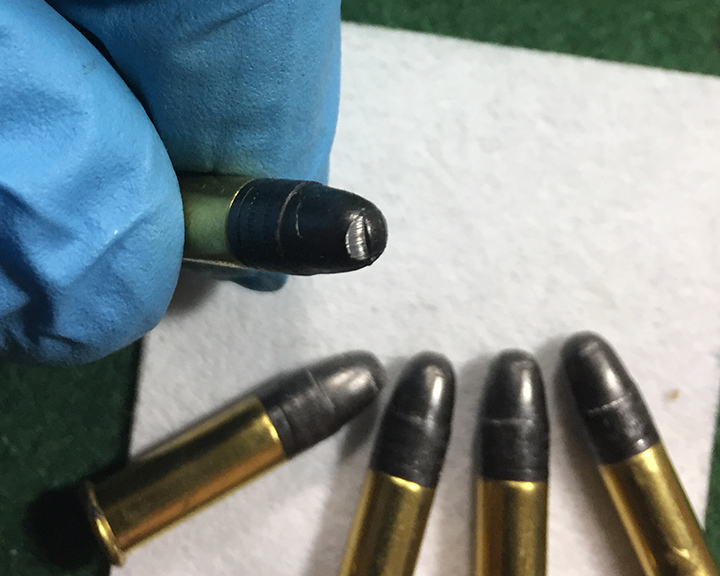 The other magazines can have cartridge flop where the cartridge flips up during recoil and doesn’t feed directly into the chamber and deforms the bullet during feeding. Just because pistol functions doesn’t mean it’s feeding correctly. So you can test it yourself. Load first round then hand eject it and check bullet for deformation. Shoot a round and eject the loaded cartridge to see if deformed during normal function. I’ve seen it vary from gun to gun. Thanks to all who have responded to my post with questions. Quite helpful indeed all the points to consider and advice given. I see the conversion is available with options for threaded barrel - for attaching weights. The added cost to have threaded end seems minor but wasn't sure if there were downsides to that to take into account. Checking to see if there are opinions on that area. I'm happy with the balance of my RO so maybe it is whether the extra weights are needed to achieve the same balance perhaps? You hear me discuss this issue at time mark 6:18 - 9:40. In the video, the lower is a MCP lower. The mag catch I use with the Nelson is a 'standard' mag catch. It is Wilson Combat. The mags in the video are the Nelson mags. I only separate the two piece guide rod when I am disassembling the 1911 for cleaning. When removing the .45 upper and installing the Nelson, you do not disassemble the guide rod. You just remove the slide catch and slip off the upper. This is why a full length guide rod is preferred because it keeps the recoil spring in place. The fact that my full length guide rod is two piece has nothing to do with using a .22 conversion. You just might become my new best friend. I have been working with two gunsmiths to solve several issues with my Nelson and the bullet shaving issue has stumped us all (see photo). The bullet shaving problem occurs every time with all five of my Nelson mags and all four of my non-magnetic GSG mags. Can you tell me what mags you are using to solve this issue and the modifications you are making? If we need to take the discussion to PM so as not to hijack WillH's post, we can do that. Thank you. WillH wrote: Thanks to all who have responded to my post with questions. Quite helpful indeed all the points to consider and advice given. I see the conversion is available with options for threaded barrel - for attaching weights. The added cost to have threaded end seems minor but wasn't sure if there were downsides to that to take into account. Checking to see if there are opinions on that area. I'm happy with the balance of my RO so maybe it is whether the extra weights are needed to achieve the same balance perhaps? WillH, I purchased the threaded barrel version with the weight thinking 1)it would allow me to approach the same weight as a 1911, and 2)would stabilize the gun quicker much like the forward weights on my Pardini SPBE .22 do. Thought #1 turned out to be wrong. The additional weight is not needed to get close to the same weight as a .45 1911. For thought #2, I am not yet convinced it is helping. So for now, I shoot without the weight. But having said that, if I had to do it all over again, I would purchase the threaded barrel just to have the option. No worries here about hijacking posts gentlemen - I find all of the related tangents interesting as well.. Good commentary on the threaded bbl question seems to make sense keeping options open if no real downside except few extra bucks. Plunker wrote: Second question : two piece guild rod is for ease of quick change over ( same lower ) or an additional something else ? Yes quick change over, keeps everything together.